As I sit here listening to some new kalimba tracks I’m working on, I’d like to bring to the attention of all of the drummers & percussionists who read this that there is a golden opportunity to get your hands on the fully custom drum set of your dreams! Steve Weiss Music now offers custom drums in four brands – Gretsch, Yamaha, Pearl, and Ludwig – all with some pretty sweet options, click around through them all! 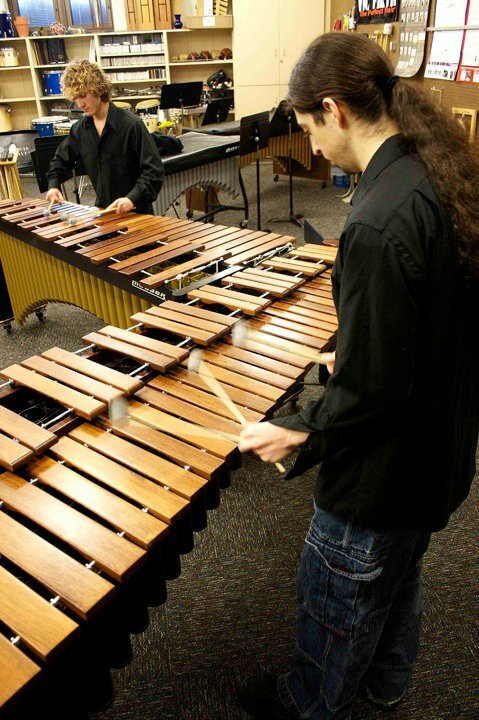 When you build your own custom drum set, you have complete control over things like wood type, drum & hardware finish, bearing edges, and obviously the sizes of the drums and the configuration. Too much to choose from? They’ll even help you along the way to make sure you’re getting what you want from it if you call or fill out the short form on their page. 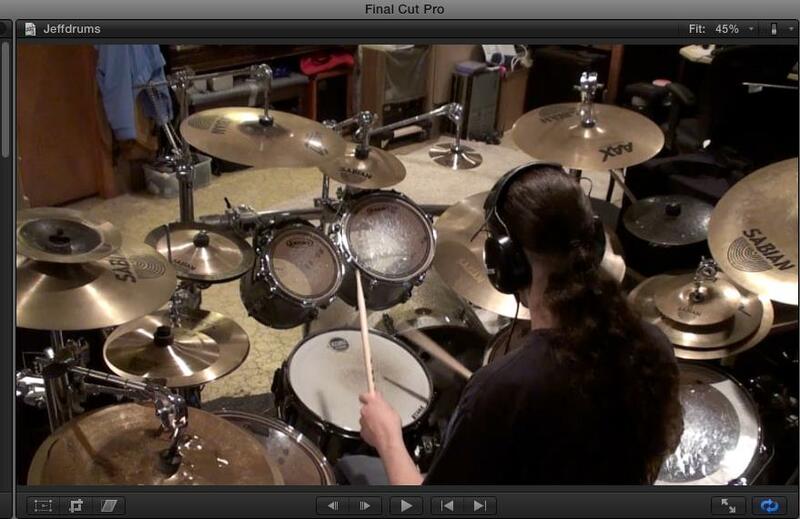 ***You are no longer limited to the standard 4 and 5-piece drum sets that you see at music stores! *** If you’ve ever said anything like, “well that one’s nice, but I’d like a bigger bass drum size with those same toms,” or “that finish would jump out better with black or gold hardware,” then … make it happen! There are some wild and crazy possibilities with this – the conventional idea of what a drum set is could soon become obsolete if this really takes off! 22″ x 18″ bass drum (birch) – 8″ x 7″, 10″ x 8″ , 12″ x 9″, 13″ x 11″, 14″ x 12″ toms (birch) – 6.5″ x 14″ metal snare – but the Sabian Cymbals bring it all to life! 1. Write out the main rhythm of the piece. 2. Write another rhythm above or below the first one, making sure to place a note where there was a rest or held-out note in the first one, to fill in the gaps or “complement” it. 3. a.) Keep in mind this second rhythm should make sense on its own, too. Notes in the second rhythm can certainly overlap and/or double those in the first rhythm in order to make it all flow better together AND separately. b.) Or, leave some gaps and fill in only strategically, sparingly, or wherever it makes the most sense or feels right for you and for the piece (although this could be considered rhythmic counterpoint). 4. 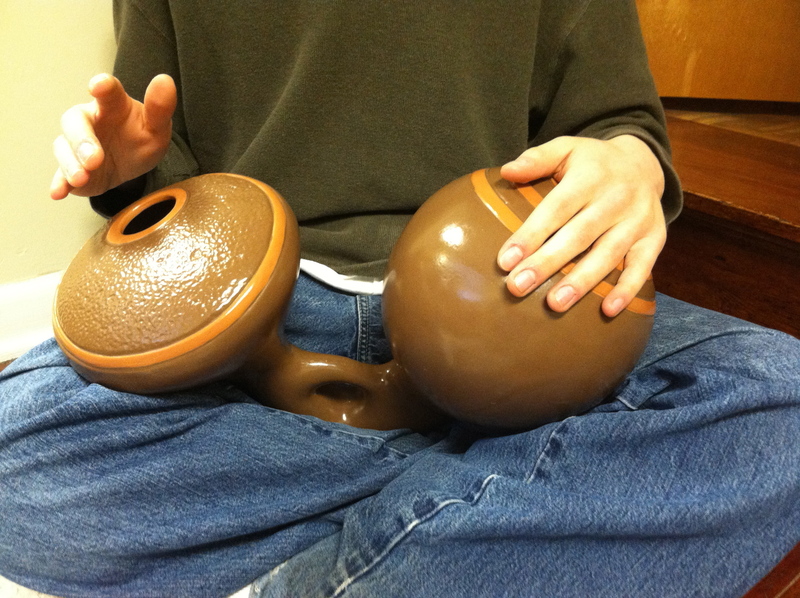 Expand rhythms out into melody/notation for your instruments of choice. Keep in mind that not every piece calls for this, so listen for the context of when to use it and when not to. 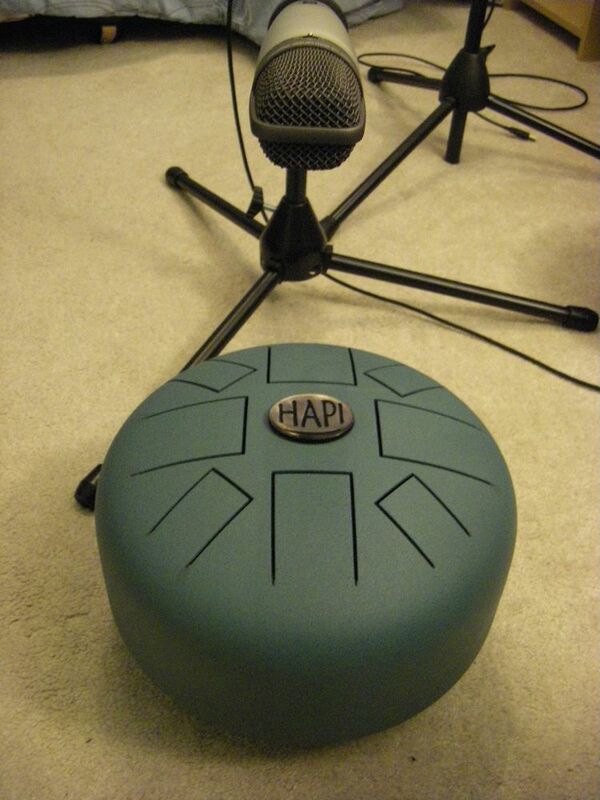 This works well in live music settings also! Its easiest in a group with a drummer and a percussionist, but experiment with other instrumentations too! 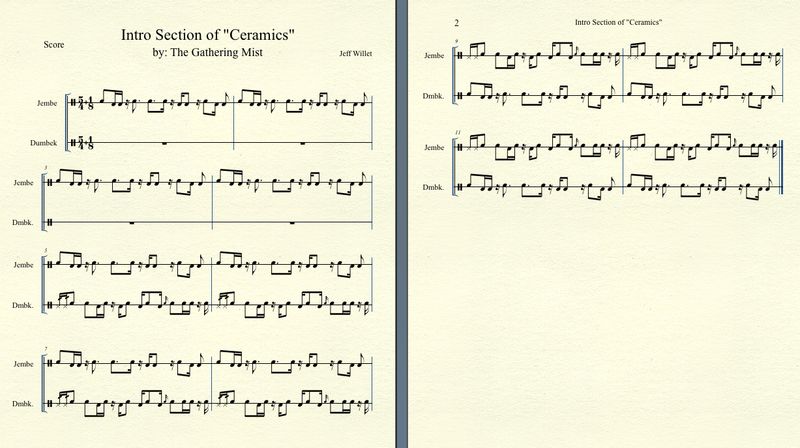 A clear example of this is in a piece I did called “Ceramics” from The Gathering Mist’s album, “Reservoir” (notated above – follow along! 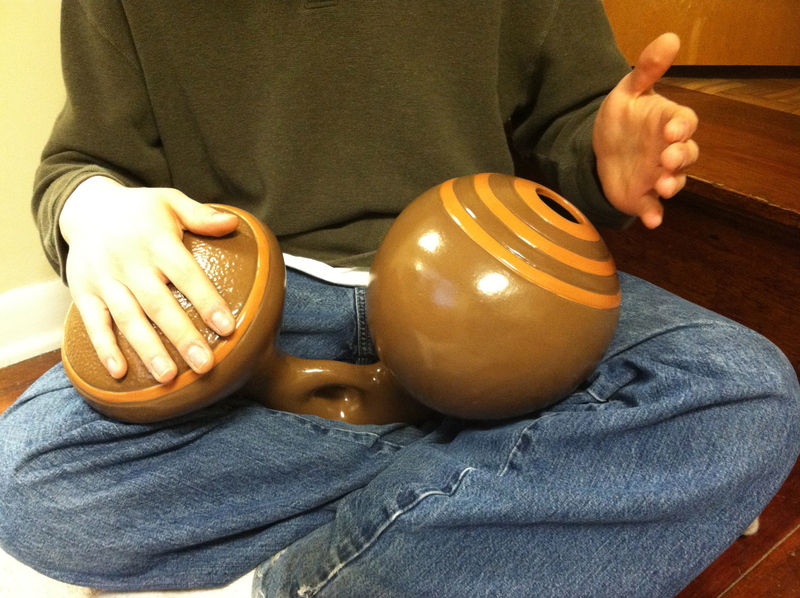 ), which starts off with a jembe playing a syncopated rhythm in 11/8, panned to one side. 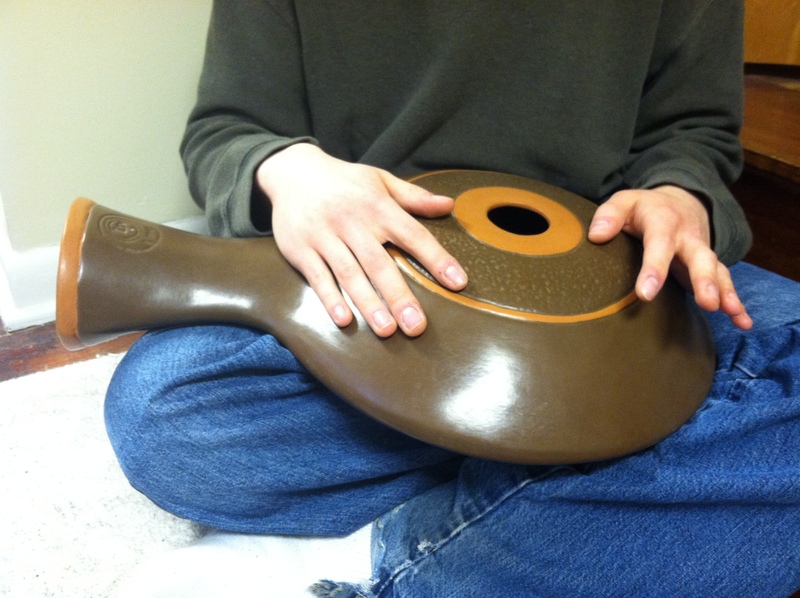 After four bars a dumbek enters, panned to the other side, playing a complementary rhythm to the jembe, still in 11/8. Four bars later at measure 9, the jembe and dumbek switch parts but the same principle still applies. Once the dumbek enters on the first beat of measure 5, the rest of that beginning section to the piece sounds like straight 16th notes because of this rhythmic complementing process. Enjoy! 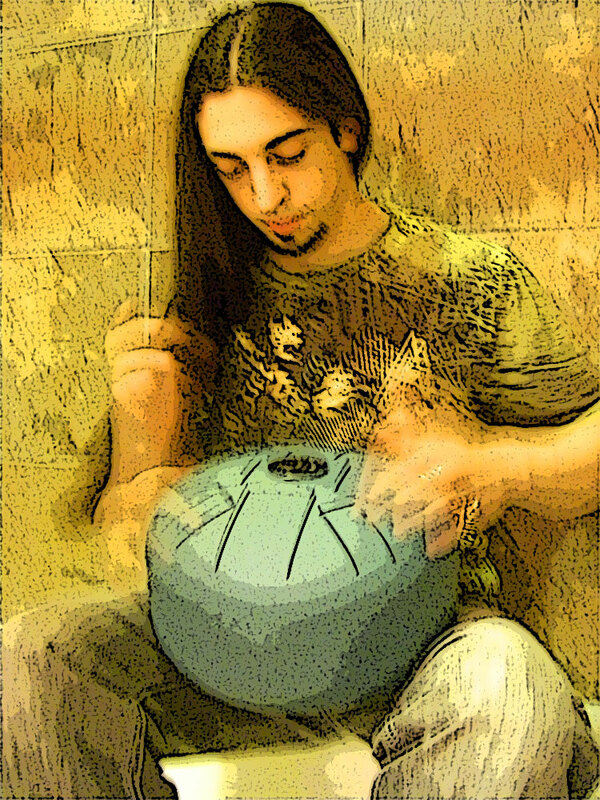 Jeff with an E minor pentatonic HAPI Drum, used often in The Gathering Mist's music! 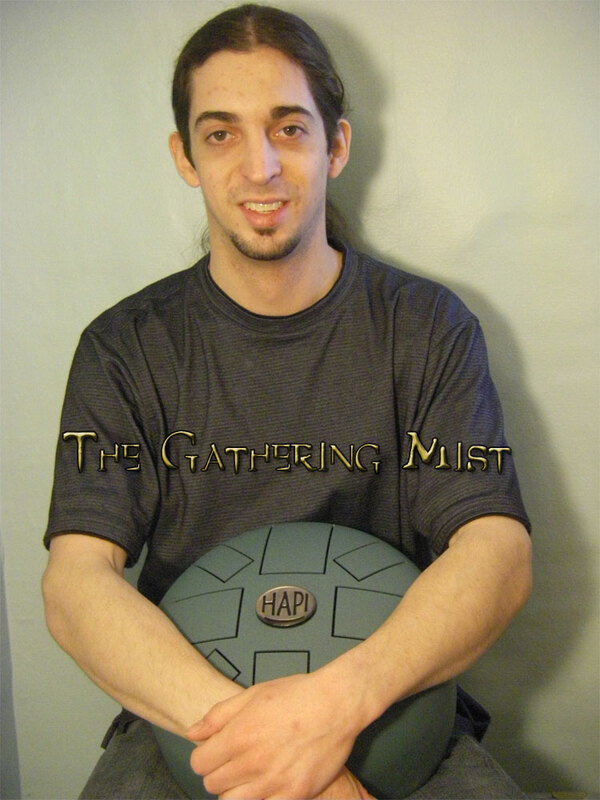 I am officially wrapping up The Gathering Mist project at this point. To explain a bit of background on this project, it was all written consecutively over about two and a half years, from the summer of 2008 when I first had the idea for the project until the release of the 2nd full length album, “Reservoir,” on Tuesday, December 14th, 2010. It was a LOT of fun to see my ideas come to life in the form of those pieces of music, and while yes they could always be improved upon, I’m proud of what I accomplished with them. My technique on a lot of instruments was pushed in order to play those parts, and a lot of new ground was explored compositionally for me as well, not to mention all of the practical audio engineering experience! 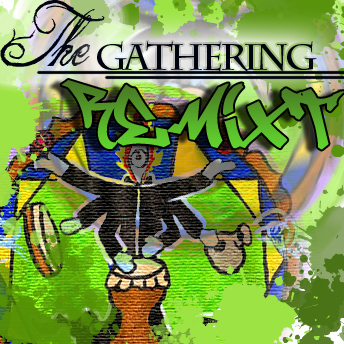 I think of The Gathering Mist’s music as one continuous thought across both albums, since I wrote it all consecutively. 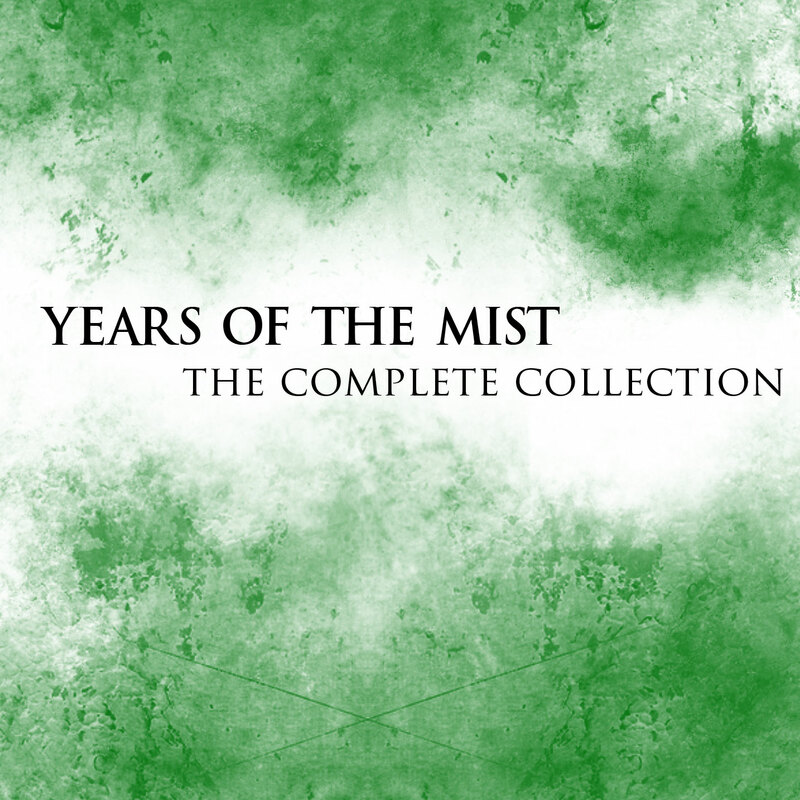 Because of this, I plan to remove both of my albums from iTunes, CDBaby, Amazon, etc and then combine them into one double album simply named, “The Gathering Mist.” Most likely available as a download only, it will feature all 33 original compositions across both albums currently available. I’ve received a lot of positive feedback and recognition from the music, so I want to keep it in rotation and see what happens. From here on out, any new material that I write will be under a different name. What name, I have no idea right now. But everything I’ve written over the past year and a half since releasing “Reservoir” has had a slightly different sound thanks to new influences, new instruments, new equipment, and a few personal changes in my life (for the better) – just everything moving forward and progressing to the next step. Expect BIG things from my next album, there is a lot of interest in it already! Some very exciting well-known guest artists are in the works, and the music is so intense with such a great groove! Exciting things are brewing, and I’ll be sure to keep you all updated the entire way! 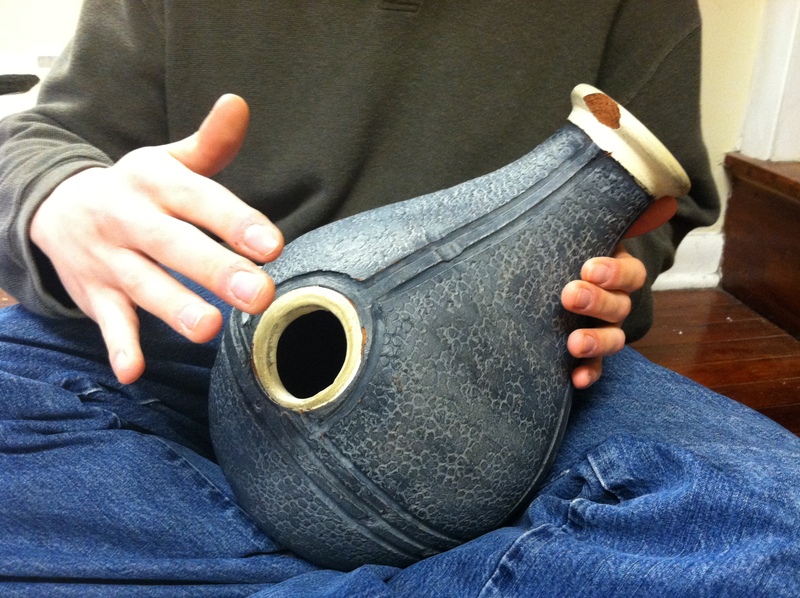 As of right now my main focus is a project called Illusionarium with my very talented girlfriend, Jen Mitlas. She always impresses the hell out of me with everything she writes, and its a privilege and an honor (and a lot of fun!) to make a concept album like this with her! Again, thank you for your continued interest and support of the music that I thoroughly enjoy making and sharing with you all. Check out Jen’s announcement of Illusionarium for some awesome new music from us!